I would think the hardest music to create would be anything from the ambient genre, because you have less instrumentation to rely on; instead, you have to build and create tones to carry your listener through each song of an album. This is why Brian Eno is the master of the genre, as his catalog showcases a wide range of emotions, some albums pulling at the tiniest strings of the heart and others going down a dark and dreary path. 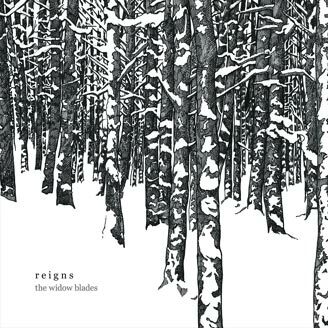 Tone is the order of the day for the UK duo REIGNS and their new album The Widow Blades. The Widow Blades is a concept album based on the disappearance of a woman in a blizzard in 1978 — and the entirety of the album, from the snow-drenched cover to the bleak soundscapes REIGN create, fits hand-in-hand with the suffocating feeling of loneliness and despair the woman no doubt felt. The album opens with “Over Tone Gulley,” a song that relies on more modern classical elements than REIGNS delves into most of the time, but the track establishes a heavy theme. The Widow Blades isn’t exactly great dinnertime background music; it is the soundtrack to a fleeting hope of survival, pulled along by the ivory of a piano. The song starts to weigh heavier and heavier as it plods along into the blizzard before silently launching into “Hybrium Sulphate,” which contains softly picked guitars and gentle pianos over creepy vocal harmonies that sound like a live reading of an Edgar Allen Poe poem. But just like the first track, “Hybrium Sulphate” picks up and starts to weigh heavier as the blizzard of sound intensifies. Songs like “The Diagram” and “I Will Burn For This” stray away from the instrumentation and rely on electronic sounds to create the mood. “I Will Burn For This” has a slight LCD Soundsystem feel — minus an actual incentive to dance — especially on the vocals, which sound like James Murphy’s if he’d drunk an entire bottle of whiskey and spent the winter reading William Faulkner. The final track on The Widow Blades is the 19-minute long “The Mounds,” and it is truly where the strength of the album lies. At times throughout the album, REIGNS struggle to flow from one song into the next, but on “The Mounds,” they are able to successfully combine three or four different movements into one song. The song opens with low, rumbling waves echoing underneath a high-pitched tone; little blips of noise fade in and out of each ear. REIGNS do a great and restrained job of letting minimal instrumentation build up gradually until strings disjointedly flutter in and muddy, distorted beats file in over a wandering bassline and piano keys. The Widow Blades isn’t an album meant to be listened to more as it is to be experienced. As “The Mounds” echoes on, you find yourself in step with REIGNS, following the footsteps the missing woman left in the snow, retracing her life with every step of your own.